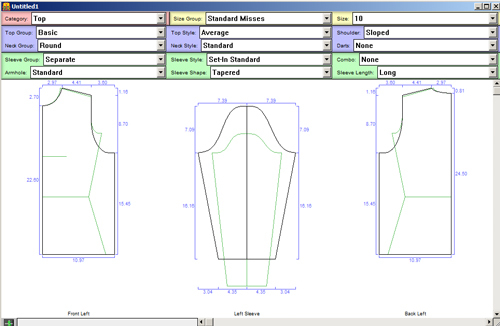 Garment Designer for Windows is a garment design program that has been on the market since 2001. It allows sewers to print a pattern, in tiled pages from a standard printer, to tape together. It also allows knitters to build and chart a garment. Knitters quickly found that the paper pattern was an excellent tool to use for blocking knits into perfect shape. Garment Styler was the previous version available from 1995 to 2001. Garment Designer provides a multitude of features which make your design world not only simple, but very visual, and in general, a lot of fun. Before we begin to discuss all the new features users will find, let's quickly overview the basic approach to design that Garment Styler provides. Since the Designer version includes all of Styler's features, this will set a good foundation.